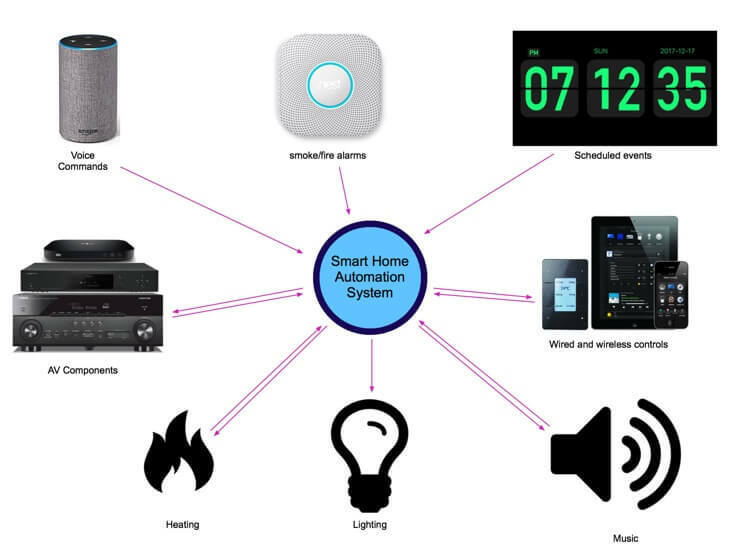 Smart Home Technology, also know as Home Automation; is the integration of most of the the technology in your home resulting in one simple to use system, where technology works with you and your lifestyle. In it’s most basic concept this could mean replacing 4 or 5 remotes in your lounge with a single Universal remote. “Alexa, leaving for the evening’ , makes sure all TV’s and music systems are off, along with lighting that is not required. When the smoke or fire alarm is triggered, all TV’s and music systems turn off to ensure the alarm can be heard. Furthermore if this happens during the hours of darkness the lights automatically turn on to enable safe exit from your property. Have technology work in the background to fit in with your routine. For instance: schedule the kitchen sky box to go to the CNBC channel every weekday morning at 06.30 then switch to Sky News channel every evening at 19.00. Wake up to random tracks playing from your morning playlist in the ensuite bathroom. The only limit here is your imagination! Whilst it’s certainly true that Smart Home tech can have many practical and useful purposes, there’s also plenty of things that can be done – just for the fun of it! Arrive home in a rush – get dinner started. Now the easy part – press “Entertain”: The lights adjust in all the right places, the “party” playlist is started and music fills the home….